Mad, bad...I've done it again. This fabulous-sounding challenge took place last year, but I didn't hear of it because, as you probably know, I live in the outer reaches, on the dark side etc. Or I just don't pay attention. This year, however, I'm keeping up with things. And it looks fascinating. I love a good challenge. And a good fight. Especially when it involves writing. 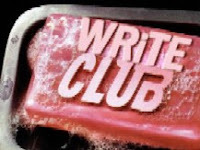 Check out D L Hammons who has thrown down the gauntlet and who explains everything here: WRiTE CLUB. Why don't you join? He's gone all out this year as well! You're a crazy woman! But I still love you. I don't think I could manage 500 competition standard words a week. Alex, he sure has! Yay! Kyra - there're over a hundred signed up so I don't expect I'll get very far. I won't participate but I will be reading. The WRiTE CLUB is an awesome challenge. I've read some of the past entries.